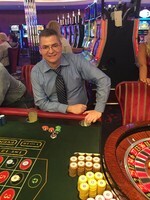 Today I returned to the US after a week aboard the Oasis of the Seas gambling at the single zero roulette table. Finished ~$2500 ahead Martingaling for a week. **Cruise Background** I wanted to vacation in Vegas this fall, my wife wanted to cruise again, so I spent a few months searching cruise lines, looking for a single zero roulette table with at least an 8-bet min/max spread. As it turns out, there are thirteen cruise ships in the world that fit that profile (that I discovered), and after checking all of them against November/December departure dates from CONUS, I downselected to the Oasis of the Seas from Royal Caribbean for a 7-Day Caribbean cruise, booked it, and thus it was so! 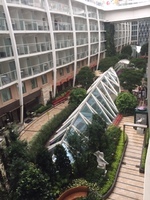 **Overall** I called out 14 crew members that I thought were exceptional in the RCCL post-cruise survey today; 11 of them in the casino - the crew were amazing everywhere. The ship itself is probably due a refit. Elevator buttons broken, chairs broken, everything looking a little run down and scuffed. I won&apos;t dig into the ports because everyone in here probably knows their way around the Caribbean by now. =D This is mostly going to be about my gambling on board, since that is mostly what I did. Aside from amazing crew, the food was impressive; the main dining room was stand-alone awesome enough to not require specialty dining - which is good because apparently RCCL&apos;s specialty dining cover charges are 3x what I&apos;m used to seeing on NCL ships. The servers in both main dining and buffet style areas made sure food was infinite. The one night that the main dinner was lobster tail or prime rib, I was a little irritated when I left dinner still semi-hungry, since a lobster tail doesn&apos;t exactly fill you up, and saw people with 5-6 lobster tails on their plates, leaving me wishing I&apos;d asked whether I could have more or not. I&apos;m sure I could have. Non-casino entertainment was middling. Mo5aic performed; a decent Acapella group. I&apos;ve been spoiled by listening to Pentatonix for years, so hearing a bassist that can&apos;t do what Avi Kaplan can do drowned out by the group leader who seems more interested in being heard than in singing well doesn&apos;t float my boat. I enjoyed the stand up comedy show the first time - jokes about ship functions, the passengers, the usual ship-board comedy. I went to see it again on the last night of the cruise when it was supposed to have new content, but seemed to be mostly recycled and not as funny the second time around. Cats was also being performed. I made it through 36 minutes of Cats before leaving; my wife left at the intermission. If you&apos;re not familiar with Cats, it has a love/hate relationship on Broadway; I really enjoy musicals, but this one doesn&apos;t capture my attention like Les Miserables or Phantom of the Opera. Ping pong tables were always hopping; I jumped in where I could to play some table tennis; flow rider on both sides was fun to watch and see wipe outs - that&apos;s some of the best entertainment - seeing people wipe out on the flow rider. Most of these things were time-fillers while I was waiting for the casino to open though, which takes me to... **The Game** For the duration of this cruise, I played single zero roulette and nothing else. The casino on board the Oasis of the Seas has four roulette tables; two American roulette tables on the smoking side, and one each American/European on the non-smoking side. I use the word "European" loosely because while it was single-zero, it had no European rules on it. All four tables were $5 - $100 on the inside, and $5 - $1000 on the outside. 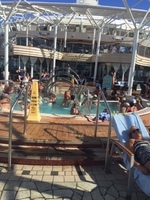 I attempted to make arrangements before the cruise as well as with the casino manager during the cruise to raise the limits for my gambling to no avail since I didn&apos;t have an established play history with Club Royale. I also requested La Partage be put into effect during my session play without luck - but that was a long shot anyway; the only single zero table I know of in the US with a minimum bet lower than $25 is the $10 - $3000 La Partage table at the Soaring Eagle in Michigan (sorry guys, terminal games don&apos;t count!) Single zero roulette tables have a 2.7% house edge; down from the scandalous 5.4% house edge of American roulette (let alone the scammy triple zero crap that Carnival Cruise lines and the Venetian in Vegas are doing); La Partage lowers it to a magnificent 1.35%, but alas - I was destined to go without. **My Bets** I was playing a martingale series betting progression; on a $5 - $1000 table, $2,000 can bankroll a 8-bet sequence where I double my bet each time I lose, restarting my bet sequence each win. Due to chip denominations, my martingale progression is $5, $10, $25, $50, $100, $250, $500, $1000, which I find more reasonable than 5/10/20/40/80/160/320/640 due to the typical chip denominations 1/5/25/100/500/1000. In a tip of my hat to superstition, my increases from $10 to $25, $100 to $250, and $1000 to $2500 where applicable are my way of "punishing" the casino for making me leave the comfort zone of the outside minimum bet. Mock me if you must; its my personal flair - if my bets grow that high I "deserve" to win more than my base bet for the stress of having to bankroll the roll. The chances of heads or tails on a coin flip are 50% for either outcome. On a single-zero table without La Partage, the equivalent bets - black/red, even/odd, 1-18/19-36 is ~48.6%, with the other 2.7% representing the green zero, or house edge - creating a theoretical loss probability of 2.7% of your bet per bet over time. While the probability of an individual spin being black or red in my case is ~48.6%, the martingale betting progression ties your bets into a session, such that on the table I&apos;m playing on, as long as I don&apos;t guess wrong 8 times in a row, I always win. On the off-chance that any newbs are reading this, this is *NOT* a "strategy" or "guaranteed way to make money." Martingale betting is a low risk, low reward means of using a large sum of money to win a little sum of money - pretty much the opposite of what people go into casinos to do. In statistical terms, the chances of me guessing wrong 8 times in a row in an 8 spin series is three tenths of one percent...but no one sits down for 8 spins and leaves - so my gambling is that when the house spins my losing sequence...I&apos;m not there. =D Such is gambling. **Goals! ** I&apos;ve learned over the years that if I don&apos;t sit at a table with a fixed goal of when to leave, I will get bored and start making side bets (other even money bets or thirds) - more ways to win also mean more ways to lose, and when I am gambling, I am heavily socializing and drinking; I can&apos;t keep track of all of it at the same time. My goal is thus to always leave with 120% of my bankroll. This trip was a bit confusing for me because I couldn&apos;t reconcile what my bankroll was. Not knowing whether the table limit would be fixed to $1000, or be able to be raised to $10,000 I brought $5,000 in cash with another $35,000 available as credit - I&apos;d wrongly assumed the casino would at least double the table min/max to $10-$2000, and had been hoping they would leave the minimum and double the maximum, adding a one-bet buffer to my 8-spin series. With a $1,000 bet maximum, I stopped bringing more than $2,000 to the casino. If my bankroll is $2,000, I aim to leave with $2400. If my bankroll is $5,000, I aim to leave with $6,000. With $10,000, I aim to leave with $12,000. I initially hoped to turn $2,000 into $2,400, but after doing that the first night gambling and the prospect of the rest of the cruise being bereft of gambling, I decided that since I&apos;d brought $5,000 to gamble with, even if I could only play with $2,000 of it, my 120% goal meant I wanted $1,000 in winnings or bust. On day two when I realized how stingy Club Royale was, and that I&apos;d be buying my own drinks, I shelled out $360 for the liquor package, and adjusted my winning threshold to also cover the liquor package. Then there was a $300 spa treatment. Then an $1800 studio photography session since my wife wanted some nice pictures - something we&apos;ve not done in a decade. With these confusing inputs leaving me unsure of how to decide if I was up or down, it came down to the fact that while the casino was generally open 8-12 hours a day, the lone roulette table with the single zero didn&apos;t open until 8:00 PM - about when the cruise shows started. I did some begging and pleading to have it opened earlier every day to mixed success - a bit on the first day and on the last day, with nothing in the middle. They really wanted people on the American tables - which I had to resist, since for much of the cruise, it was American roulette or nothing. I contented myself during those periods with drinking, socializing with other gamblers, watching, drinking, and trying to find people who didn&apos;t have the booze package so I could buy them drinks. **Fun Facts** * Over 6 days of gambling, averaging 4 hours per day, I hit the $1,000 table maximum bet twice. Both were heart-attack inducing. The first was at 0100 on day 5, I was the last gambler at the table, $1,000 on red didn&apos;t screw me, and I took it as a sign to go to bed. The second happened on Day 6; since a $2,000 loss would have left me break even at that point, I took a short break, stretched my legs, and came back. * In the same period, I hit the $250 bet mark in my progression 4 times (resetting from $250 back to $5), and the $500 bet limit zero times. $100 and below bets were too numerous to count. * Total winnings were probably closer to $2800, but I tip freely when its free money. * Despite my "follow the house" betting method of deciding to bet red or black (which capitalizes on streaks), and I never choose which to bet on, there was one dealer would occasionally call a color, and she was only wrong once. I started switching bets when she&apos;d call a color because it was spooky. If I asked her, most of the time she&apos;d say, "I don&apos;t know" - but out of 20-30 "calls" over a week that I saw her spinning for me, she missed one. * If I had the balls to play numbers or neighbor bets, I&apos;d have made tens of thousands; I don&apos;t believe in ball control; not on modern wheels, but one dealer put out four 28s in 8 spins, three of them in a row, 7 of the others were neighbor bet winners, and he just kept doing it. He&apos;s been a casino dealer 44 years...and kept telling people what number to bet on, and no one would listen to him. God, I wish I had. * I learned to play craps as a backup in case the single zero table was closed, but the craps tables were $5 - $300 with 1x odds, shifting to 3-4-5x with $50 minimum bets. I need to ease into craps, and didn&apos;t want to have to track different odds systems, nor did I want to play on a $300 limit table - all my practicing on craps was with 3-4-5x odds on a $5 - $2,000 table, and I have a tendency to double down on everything in every game. And in life too; Losing a 5/15 bet makes me put $20 on the pass line. It gets expensive quickly, so I&apos;m not playing craps with less than $5k, $10k to be comfortable, and I need at least a $2k table. * Actually, all the games were a bit ...less competitive. 6:5 blackjack, 1x craps odds, no Euro rules on the Euro table, crappy slots payouts - I get it; I really do. Captive audience, no need to compete with other casinos. Once they&apos;re on board, you&apos;ve got &apos;em for a week; they&apos;re gonna gamble or they&apos;re not. * Club Royale has terrible comps compared to Casinos at Sea with NCL. It takes 2500 points with Club Royale to earn comped drinks while gambling. Not only did Club Royale not buy my drinks this cruise, at the rate of my point earnings, it will take me 4 more cruises gambling at the same rate to earn free drinks. That&apos;s right; $10,000+ to get free drinks. I did however come away with an amazing $100 off my next cruise voucher. * Assuming total winnings of $2,800 (before tips), being right 48.6% of the time, I gambled through ~1200 roulette spins in a week. Anyway; it was a blast - but I&apos;ll probably go to Vegas for my next vacation instead of cruising. I want to gamble during the day, and go to shows in the evening, not wander around during the day, then have to decide whether I want to gamble or watch shows in the evening. Today I returned to the US after a week aboard the Oasis of the Seas gambling at the single zero roulette table. Finished ~$2500 ahead Martingaling for a week. I called out 14 crew members that I thought were exceptional in the RCCL post-cruise survey today; 11 of them in the casino - the crew were amazing everywhere. The ship itself is probably due a refit. Elevator buttons broken, chairs broken, everything looking a little run down and scuffed. I won&apos;t dig into the ports because everyone in here probably knows their way around the Caribbean by now. =D This is mostly going to be about my gambling on board, since that is mostly what I did. Aside from amazing crew, the food was impressive; the main dining room was stand-alone awesome enough to not require specialty dining - which is good because apparently RCCL&apos;s specialty dining cover charges are 3x what I&apos;m used to seeing on NCL ships. The servers in both main dining and buffet style areas made sure food was infinite. The one night that the main dinner was lobster tail or prime rib, I was a little irritated when I left dinner still semi-hungry, since a lobster tail doesn&apos;t exactly fill you up, and saw people with 5-6 lobster tails on their plates, leaving me wishing I&apos;d asked whether I could have more or not. I&apos;m sure I could have. Non-casino entertainment was middling. Mo5aic performed; a decent Acapella group. I&apos;ve been spoiled by listening to Pentatonix for years, so hearing a bassist that can&apos;t do what Avi Kaplan can do drowned out by the group leader who seems more interested in being heard than in singing well doesn&apos;t float my boat. I enjoyed the stand up comedy show the first time - jokes about ship functions, the passengers, the usual ship-board comedy. I went to see it again on the last night of the cruise when it was supposed to have new content, but seemed to be mostly recycled and not as funny the second time around. Cats was also being performed. I made it through 36 minutes of Cats before leaving; my wife left at the intermission. If you&apos;re not familiar with Cats, it has a love/hate relationship on Broadway; I really enjoy musicals, but this one doesn&apos;t capture my attention like Les Miserables or Phantom of the Opera. I was playing a martingale series betting progression; on a $5 - $1000 table, $2,000 can bankroll a 8-bet sequence where I double my bet each time I lose, restarting my bet sequence each win. Due to chip denominations, my martingale progression is $5, $10, $25, $50, $100, $250, $500, $1000, which I find more reasonable than 5/10/20/40/80/160/320/640 due to the typical chip denominations 1/5/25/100/500/1000. In a tip of my hat to superstition, my increases from $10 to $25, $100 to $250, and $1000 to $2500 where applicable are my way of "punishing" the casino for making me leave the comfort zone of the outside minimum bet. Mock me if you must; its my personal flair - if my bets grow that high I "deserve" to win more than my base bet for the stress of having to bankroll the roll. While the probability of an individual spin being black or red in my case is ~48.6%, the martingale betting progression ties your bets into a session, such that on the table I&apos;m playing on, as long as I don&apos;t guess wrong 8 times in a row, I always win. On the off-chance that any newbs are reading this, this is *NOT* a "strategy" or "guaranteed way to make money." Martingale betting is a low risk, low reward means of using a large sum of money to win a little sum of money - pretty much the opposite of what people go into casinos to do. In statistical terms, the chances of me guessing wrong 8 times in a row in an 8 spin series is three tenths of one percent...but no one sits down for 8 spins and leaves - so my gambling is that when the house spins my losing sequence...I&apos;m not there. =D Such is gambling. I&apos;ve learned over the years that if I don&apos;t sit at a table with a fixed goal of when to leave, I will get bored and start making side bets (other even money bets or thirds) - more ways to win also mean more ways to lose, and when I am gambling, I am heavily socializing and drinking; I can&apos;t keep track of all of it at the same time. My goal is thus to always leave with 120% of my bankroll. This trip was a bit confusing for me because I couldn&apos;t reconcile what my bankroll was. Not knowing whether the table limit would be fixed to $1000, or be able to be raised to $10,000 I brought $5,000 in cash with another $35,000 available as credit - I&apos;d wrongly assumed the casino would at least double the table min/max to $10-$2000, and had been hoping they would leave the minimum and double the maximum, adding a one-bet buffer to my 8-spin series. With a $1,000 bet maximum, I stopped bringing more than $2,000 to the casino. If my bankroll is $2,000, I aim to leave with $2400. If my bankroll is $5,000, I aim to leave with $6,000. With $10,000, I aim to leave with $12,000. I initially hoped to turn $2,000 into $2,400, but after doing that the first night gambling and the prospect of the rest of the cruise being bereft of gambling, I decided that since I&apos;d brought $5,000 to gamble with, even if I could only play with $2,000 of it, my 120% goal meant I wanted $1,000 in winnings or bust. On day two when I realized how stingy Club Royale was, and that I&apos;d be buying my own drinks, I shelled out $360 for the liquor package, and adjusted my winning threshold to also cover the liquor package. Then there was a $300 spa treatment. Then an $1800 studio photography session since my wife wanted some nice pictures - something we&apos;ve not done in a decade. With these confusing inputs leaving me unsure of how to decide if I was up or down, it came down to the fact that while the casino was generally open 8-12 hours a day, the lone roulette table with the single zero didn&apos;t open until 8:00 PM - about when the cruise shows started. I did some begging and pleading to have it opened earlier every day to mixed success - a bit on the first day and on the last day, with nothing in the middle. They really wanted people on the American tables - which I had to resist, since for much of the cruise, it was American roulette or nothing. I contented myself during those periods with drinking, socializing with other gamblers, watching, drinking, and trying to find people who didn&apos;t have the booze package so I could buy them drinks. * Over 6 days of gambling, averaging 4 hours per day, I hit the $1,000 table maximum bet twice. Both were heart-attack inducing. The first was at 0100 on day 5, I was the last gambler at the table, $1,000 on red didn&apos;t screw me, and I took it as a sign to go to bed. The second happened on Day 6; since a $2,000 loss would have left me break even at that point, I took a short break, stretched my legs, and came back. * In the same period, I hit the $250 bet mark in my progression 4 times (resetting from $250 back to $5), and the $500 bet limit zero times. $100 and below bets were too numerous to count. * Total winnings were probably closer to $2800, but I tip freely when its free money. * Despite my "follow the house" betting method of deciding to bet red or black (which capitalizes on streaks), and I never choose which to bet on, there was one dealer would occasionally call a color, and she was only wrong once. I started switching bets when she&apos;d call a color because it was spooky. If I asked her, most of the time she&apos;d say, "I don&apos;t know" - but out of 20-30 "calls" over a week that I saw her spinning for me, she missed one. * If I had the balls to play numbers or neighbor bets, I&apos;d have made tens of thousands; I don&apos;t believe in ball control; not on modern wheels, but one dealer put out four 28s in 8 spins, three of them in a row, 7 of the others were neighbor bet winners, and he just kept doing it. He&apos;s been a casino dealer 44 years...and kept telling people what number to bet on, and no one would listen to him. God, I wish I had. * I learned to play craps as a backup in case the single zero table was closed, but the craps tables were $5 - $300 with 1x odds, shifting to 3-4-5x with $50 minimum bets. I need to ease into craps, and didn&apos;t want to have to track different odds systems, nor did I want to play on a $300 limit table - all my practicing on craps was with 3-4-5x odds on a $5 - $2,000 table, and I have a tendency to double down on everything in every game. And in life too; Losing a 5/15 bet makes me put $20 on the pass line. It gets expensive quickly, so I&apos;m not playing craps with less than $5k, $10k to be comfortable, and I need at least a $2k table. * Actually, all the games were a bit ...less competitive. 6:5 blackjack, 1x craps odds, no Euro rules on the Euro table, crappy slots payouts - I get it; I really do. Captive audience, no need to compete with other casinos. Once they&apos;re on board, you&apos;ve got &apos;em for a week; they&apos;re gonna gamble or they&apos;re not. * Club Royale has terrible comps compared to Casinos at Sea with NCL. It takes 2500 points with Club Royale to earn comped drinks while gambling. Not only did Club Royale not buy my drinks this cruise, at the rate of my point earnings, it will take me 4 more cruises gambling at the same rate to earn free drinks. That&apos;s right; $10,000+ to get free drinks. I did however come away with an amazing $100 off my next cruise voucher. * Assuming total winnings of $2,800 (before tips), being right 48.6% of the time, I gambled through ~1200 roulette spins in a week. Anyway; it was a blast - but I&apos;ll probably go to Vegas for my next vacation instead of cruising. I want to gamble during the day, and go to shows in the evening, not wander around during the day, then have to decide whether I want to gamble or watch shows in the evening. Cabin was fine; small couch and a mini-fridge. The balcony looking over the central park is overrated; I&apos;m not sure that added any value, and we certainly didn&apos;t spend any time on it, so I don&apos;t think I&apos;d buy it again. I did each the cheese plate and the wine that came with the room upgrade though! Hurricane damage still being recovered; just wandered around - very touristy, super expensive. St. Thomas was literally 50 jewelry stores, 1 liquor store, and nothing else in the "shopping" area. It was completely redundant; and absolutely nothing was remotely anything like a good deal. The cigars I smoke come from Hondurus, they cost $8.25 apiece to buy in Florida, less if I buy by the box. Here, they were $20 to $30 apiece, but with a "sale" to "buy one get one free." That&apos;s not a sale. That&apos;s not even a good deal. That was the theme everywhere. Terrible prices posing as sales. I was expecting to see cheaper prices; things we can&apos;t get in the US, things to encourage us to spend money there.